The judgment by Justice Dhananjaya Y Chandrachud, which runs upto 165 pages, is the longest among all four judgments delivered in the Sabarimala case. Most importantly, the observation made by Justice Chandrachud that social exclusion of women, based on menstrual status, is a form of untouchability, will have far-reaching consequences. Justice Chandrachud, like the CJI, holds that devotees of Lord Ayyappa do not satisfy the judicially enunciated requirements to constitute a religious denomination under Article 26 of the Constitution. Though he concurs with CJI’s opinion that the practice of excluding women from the temple at Sabarimala is not an essential religious practice, he goes further to hold that a claim for the exclusion of women from religious worship, even if it be founded in religious text, is subordinate to the constitutional values of liberty, dignity and equality. He also holds that exclusionary practices are contrary to constitutional morality and observes that constitutional legitimacy shall not be granted to practices which derogate from the dignity of women and to their entitlement to an equal citizenship. The judge also holds that notions of “purity and pollution”, which stigmatize individuals, have no place in a constitutional order. Finally, the notifications issued by the Devaswom Board prohibiting the entry of women between the ages of 10 and 50, are held unconstitutional. Without doubt, the judgment by Justice Chandrachud is a feast to read as it covers almost every aspect of the Sabarimala case, and beyond. The judgment succinctly narrates the history of Sabarimala temple and Lord Ayyappa. Justice Chandrachud deals with almost every submission made pertaining to essential religious practices, religious denomination status of Ayyappa devotees, Article 17, “untouchability” and the notions of purity, constitutional rights of the deity. While the judgment authored by the Chief Justice do not address the argument based on Article 17 (abolition of untouchability) of the Constitution, Justice Chandrachud widely discusses it vis-à-vis the issue of practice of exclusion based on menstruation constitutes a form of untouchability and is prohibited by Article 17 of the Constitution, egregiously raised during the arguments, particularly by Senior Advocate Indira Jaising and Amicus Curiae Raju Ramachandran. The judge discusses the history, the constitutional assembly debates, in relation to Article 17 and observes that background of Article 17 lies in protecting the dignity of those who have been victims of discrimination, prejudice and social exclusion. The judge further holds that Article 17 not only applies to untouchability practices in relation to lower castes, but it will also apply to the systemic humiliation, exclusion and subjugation faced by women. He further observes that the ideology of “purity and pollution” is a violation of the constitutional right against “untouchability”. “Prejudice against women based on notions of impurity and pollution associated with menstruation is a symbol of exclusion. The social exclusion of women, based on menstrual status, is but a form of untouchability which is an anathema to constitutional values. As an expression of the anti-exclusion principle, Article 17 cannot be read to exclude women against whom social exclusion of the worst kind has been practiced and legitimized on notions of purity and pollution. Article 17 cannot be read in a restricted manner. But even if Article 17 were to be read to reflect a particular form of untouchability, that article will not exhaust the guarantee against other forms of social exclusion. The guarantee against social exclusion would emanate from other provisions of Part III, including Articles 15(2) and 21. 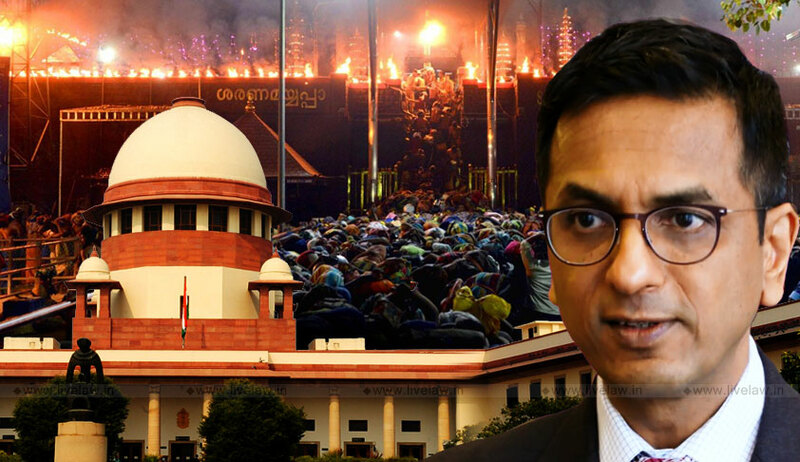 Exclusion of women between the age groups of ten and fifty, based on their menstrual status, from entering the temple in Sabarimala can have no place in a constitutional order founded on liberty and dignity,” Justice Chandrachud said. Justice Chandrachud has also taken serious note of customs which consider menstruating women as polluting the surroundings. He observed that irrespective of the status of a woman, menstruation has been equated with impurity, and the idea of impurity is then used to justify their exclusion from key social activities. Justice Chandrachud makes a significant observation regarding the contention raised by Advocate J Sai Deepak that right to preserve the celibacy of the deity is a protected constitutional right and extends tys merely because a deity has been granted limited rights as juristic persons under statutory law does not mean that the deity necessarily has constitutional rights. Quoting Article 25, Justice Chandrachud says this right vests in a collection of individuals which demonstrate (i) the existence of a religious sect or body; (ii) a common faith shared by those who belong to the religious sect and a common spiritual organisation; (iii) the existence of a distinctive name and (iv) a common thread of religion. “The individual is the bearer of rights under Part III of the Constitution. The deity may be a juristic person for the purposes of religious law and capable of asserting property rights. However, the deity is not a ‘person’ for the purpose of Part III of the Constitution. The legal fiction which has led to the recognition of a deity as a juristic person cannot be extended to the gamut of rights under Part III of the Constitution,” the judge holds. On essentiality of religious practices, Justice Chandrachud, like the CJI, observes that, in determining the essentiality of a practice, it is crucial to consider whether the practice is prescribed to be of an obligatory nature within that religion. He also adds that a practice claimed to be essential has been carried on since time immemorial or is grounded in religious texts, does not lend to it constitutional protection unless it passes the test of essentiality. “If a practice is optional, it has been held that it cannot be said to be ‘essential’ to a religion. A practice claimed to be essential must be such that the nature of the religion would be altered in the absence of that practice. If there is a fundamental change in the character of the religion, only then can such a practice be claimed to be an ‘essential’ part of that religion,” he said.